Southeastern Wisconsin Asphalt Contracting Company | Asphalt Paving & Maintenance | Concrete Services | Asphalt Contractors Inc.
Asphalt Contractors Inc, Bringing Innovation to the Paving World! Asphalt Contractors Inc strives to always use the best industry practices. We believe in quality to an unreasonable degree and are dedicated to always providing the best service. Reliable asphalt paving service since 1979. We are not just paving roads. We are paving the way. Over 30 years of experience providing guaranteed quality asphalt paving services throughout Wisconsin. Our experienced crews crush up to 3,000 tons of asphalt per day. Asphalt Contractors protects and makes your asphalt look like new with only the finest workmanship and precision. Minimize subcontracting overhead – we manufacture top-quality asphalt ourselves. We can partially or fully remove the paved surface, then use the reclaimed asphalt to re-pave. New construction excavation, landscape grading, drainage ditches, interstate highways and contouring. We build concrete driveways, walkways and parking lots, including features like curbing and gutters.Concrete and asphalt go together like two peas in a pod. Commercial or residential we offer concreted services all around. We are your full service paving contractor. Our specialty services include everything from guard rail to geotextile paving fabric. Asphalt Contractors Inc. plans, manages and executes asphalt projects while maintaining strict quality and cost controls. Asphalt Contractors Inc. has been delivering high-quality asphalt services in Wisconsin and Illinois since 1979. We take pride in on-time, on-budget paving projects that meet or exceed expectations. We are capable of handling a wide variety of projects, including asphalt & concrete paving, milling & recycling, seal coating, drain-tile, sewer work, striping and others. We handle every part of the process to cut out sub-contract overhead that you’d have to pay for. We’ve built parking lots, roads, driveways, walkways, even an olympic-sized running track. Asphalt Contractors Inc. is best known for asphalt paving, but we’re just as skilled at concrete paving for residential and commercial projects. Get a free estimate for your paving project. We’ll respond right away. We have only top notch equipment ensuring efficiency and quality. Licensed and Insured with an A+ Rating on the BBB year after year. We have all our own equipment and produce our own materials minimizing cost. From detail oriented project planning to managing and completing – we have you covered. Founded in 1979, our asphalt team has unrivaled experience and industry passion. We keep you well informed and are always available for questions and concerns. We are a full service asphalt paving contractor that covers southeast Wisconsin and northeast Illinois, performing a large spectrum of services and working with both residential and commercial customers. As leaders in the asphalt industry, no one understands the importance of asphalt maintenance better than our contractors. You made a worthwhile investment when choosing Asphalt Contractors Inc. to pave your driveway or parking lot – let us ensure you get the most use out of your pavement by keeping it in peak condition. We’ll design a maintenance program that suits the unique needs of your pavement; patching, crack filling, and seal coating your asphalt to prolong its life and help you avoid repaving. Parking lot striping is also included in our commercial asphalt maintenance services. Contact Asphalt Contractors Inc. to schedule asphalt maintenance in SE Wisconsin. 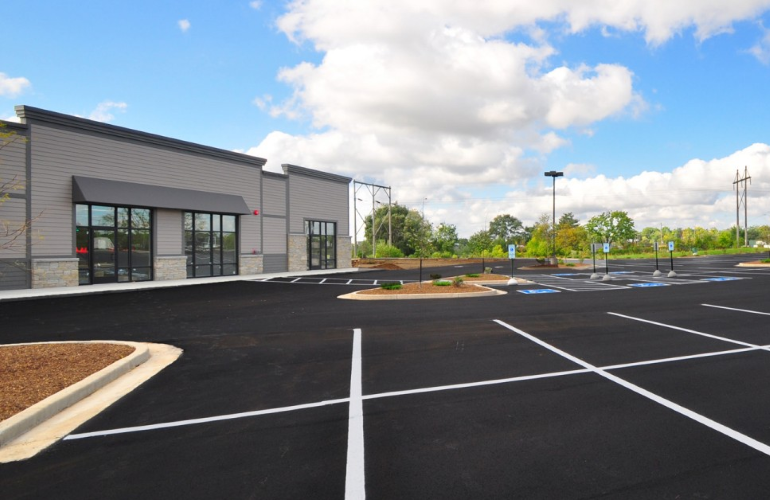 The best choice for concrete and asphalt services in Milwaukee is Asphalt Contractors Inc. A reliable and vast supply of resources and experienced contractors means we can meet the growing demand for good asphalt work in Franklin, Oak Creek, West Allis, Wauwatosa and the surrounding areas. We’ve worked on a variety of asphalt and concrete projects – school running tacks, mall parking lots, and custom residential walkways are just a few of them. Take a look at our gallery and project portfolio to see some of our work for yourself. Don’t hesitate to give us a call – we’d love to discuss your next project and give you a free estimate.